We compared three dividend investing scenarios to see if using technical indicators improves fundamental investing. It does. In the first scenario, we relied only on fundamental data and the consensus street analyst recommendation. In the second scenario, we required some level of bullish technical indication. In the third scenario, we required a stronger level of bullish technical indication. The combination of fundamentals and the stronger bullish technical indication was a hands down winner for both total return over five years, and for avoidance of the 2008 market crash. This is not a study of which technical indicators are helpful or efficacious, but whether, as a type of tool, their use improves an otherwise fundamental stock selection process. The study shows that technical considerations do help. To perform the analysis, we used the Recognia backtesting tool. It is based on fundamentals, price performance, analyst opinions and certain technical patterns and indicators. The tool is available to customers of major brokers such as Schwab, Fidelity and TD Waterhouse, who meet certain account size or account activity minimums. In brief, Recognia does this: They use data from five years ago to select stocks that met the filter criteria defined by the user at that time in the past. They then rank those stocks according to each filter criterion and average the ranks to create a final rank. They then hypothetically purchase the 10 highest ranked stocks (or as many as there are if less than 10), at the price at that time. They equal weight the stocks and hold them for 13-weeks (3-months). At the end of 13-weeks they repeat the selection process using the data that existed at that time, making additions and deletions to the prior list to end up with the top 10 stocks at that point in time. They repeat the process each 13-weeks (total of 20 selection events), and measure the total return of the process over various time periods, and plot the cumulative return over the entire 5 year period. The difference between Screens A, B and C is the “strength” of bullish technical indications that must also be present at the time of selection. Screen A requires zero bullish indication. Screens B and C require bullish technical indication ranked on a 0-5 strength scale. Screen B requires at least an indicator strength of 1, and Screen C requires at least and indicator strength of 2. The indicators used are various moving average crosses and oscillators. Oscillators include; Bollinger Bands Commodity Channel Index, Fast Stochastic, Slow Stochastic, KST, Momentum, RSI, and Williams R%. The moving average indicators include single, double and triple moving average crossovers using various time periods. We do not know, but presume at this point (to be researched further later) that if more than one indicator is bullish, that would increase the technical strength rating too. Interjecting our own view, we would like to see confirmation from a second indicator to minimize false positives, and the lack of or lower strength of bearish indications. It is common for both bullish and negative indications to be present, so looking for a net bullish indication is important, in our view. The most important difference between the three sets of screen criteria manifests in down markets. These three charts plot the 5-year total return of the backtested portfolios (shown in green) versus the S&P 500 (shown in red — good investable proxies SPY, IVV or VFINX). Screen A is on top and Screen C is on the bottom. 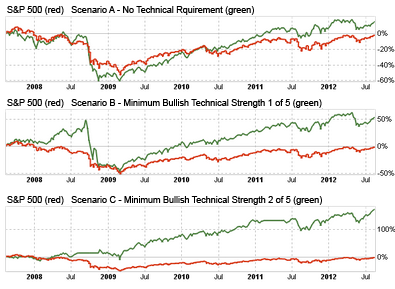 Screen C (fundamental plus minimum bullish technical indicator strength of 2 out of 5) is the superior choice. It generated more total return over 5 years, but perhaps more importantly it outperformed the S&P 500 during the 2008 crash. Even though each screen includes a minimum average “street” recommendation of HOLD, that was insufficient to prevent the large losses in the 2008 crash. The requirement for a minimum bullish indicator strength of 2 was the salvation in 2008. Avoiding losses is not only mathematically important, it is absolutely emotionally critical. For all that one might say or think, when faced with a plunging portfolio, most people will bail out (probably too late) and then wait too long to re-enter. The fact that Screen C prevents the kind of plunge that would cause an emotionally driven exit is perhaps its most valuable feature. Using no bullish indicators actually produces a worse drop during the market crash, probably because yields become more attractive as stocks drop, and a ranking system that includes dividends without bullish indicators might encourage an investor to try catching a falling knife. Using only a low bullish indicator strength worked better than none on an overall basis, but did not prevent the full participation in the market crash, thereby exposing the investor to the badly timed tardy emotional exit and fear-driven tardy re-entry. By requiring a stronger bullish indication with a strength rating of at least 2 kept us out of trouble. Price chart analysis should be used to cull the fundamentally selected list of prospective stock purchases. It’s true that this analysis lacks specificity as to which bullish indicators came into play at each of the 20 portfolio reconstitution events over the 5 years; or just how exactly the indicator strength manifested itself; or whether more than one indicator was bullish at the same time for confirmation. However, it does fairly clearly establish that while fundamentals are necessary, they are not sufficient to achieve good results. In a subsequent study we will delve into the matter of which indicators work best within the Recognia tool. In addition to the total return for various time periods, this table shows the average number of qualifying stocks that the method used over the 20 portfolio reconstitutions that took place at the end of each 13-week period. The maximum number of stocks used in a simulation was 10. If there were more than 10 qualifying stocks, then only the top ten ranked stocks would be used. This table shows all of the companies in the US and Canada that pass the combined fundamental screen with at least a bullish indicator strength of 2 out of 5 as of 2012-08-20. Only the top 10 rated stocks would go into a portfolio begun today under the Recognia methodology tested in this experiment. There were 14 stocks that passed Screen C today, shown in the table below along with some of their attributes. Note: The variable width green shading over each number highlights its rank versus the other data in the same column. To be able to consistently use wider green shading for better numbers, we inverted the debt-to-capital (to capital-to-debt) and inverted the consensus recommendation (from “1- best to 5- worst” to “5 -best to 1- worst”). Note: This list is not a set of QVM recommendations, although they are certainly worthy of further study. It is the list generated by the Recognia backtesting tool. In a prior Seeking Alpha article, we used the Recognia tool to investigate whether high yields are “dangerous”, if bulllish technical indicators are also applied in the selection process. This entry was posted on Tuesday, August 21st, 2012 at 5:18 PM and is filed under Analysis, Interesting Charts. You can follow any responses to this entry through the RSS 2.0 feed. Both comments and pings are currently closed.